When in Paris after the Charlie Hebdo attacks last January, I wrote a column suggesting that we all had to demonstrate a new toughness. At that time, I thought the scale of ISIS’ attacks on Western targets was contained by its avowed doctrine of territorial legitimacy. I assumed any attacks in the West would be carried out by lone wolves or with one or two partners. Ever since it first declared a caliphate, ISIS’ leadership consistently expressed the intent of fighting a more or less conventional war in a well-defined piece of territory spreading across Iraq and Syria. Their surprising initial victories reinforced that strategy. And it allowed them to pursue a war against the Yazidis, which the American Holocaust Museum has declared a genocide. But then the Americans arrived, eager to engage a Jihadist army in direct combat. And the Kurdish Peshmerga fighters began to make inroads. So ISIS responded, by shifting its strategy towards new tactics: fighting a more common, irregular, guerrilla war, as the Taliban had often done successfully in Afghanistan and militants had done in Iraq before them. Then the Russians arrived to support Syrian President Al Assad. Although their initial targets have not been ISIS strongholds, it has changed the dynamic once again. ISIS leaders understand that with the US on one side and the characteristically merciless Russians on the other, time is running out. It is one thing to take on one of them. It is quite another to take on both. They can replenish their forces with raw new recruits. But they probably can’t do it fast enough to hold off all sides. And the apparent execution by drone of Jihadi John, their poster child, threatens a further dent in their recruitment campaign. So, the ever flexible ISIS leadership has moved to a new stage in their tactics – war by terror. First, killing civilians at home in Europe in highly symbolic settings. Their intent here is to provoke a debate about these countries’ involvement in Syria and Iraq and thus break the political will of the western countries. There is, in other words, a cost to be paid for military intervention. Second, to convince potential new recruits that with limited training they can still play a crucial role as a martyr. After all, if you are going to die as a martyr, you don’t want to do so by the side of the road in the middle of the desert. You want to do so on the streets of Paris where everyone will know who you were and what you did. Third, to convince the west that you are still a formidable force – everywhere. The new tactic involves soft civilian targets. They involve country nationals and foreign recruits. The enemy is everywhere and nowhere. It is a classic terrorist response. First came the Russian plane crash in the Sinai – most probably caused by an ISIS bomb.Then these horrific attacks in Paris – claimed by ISIS and blamed on ISIS – in neighborhoods that I, and many American tourists, frequent when we visit. I spent the evening of the attacks frantically trying to reach my family and friends. My sister-in-law, Lorene Aldabra, is a professional singer and musician who often visits the Bataclan concert hall, scene of so much carnage. When you have to spend time tracking down loved ones, you really understand what this new war means. The declarations of support are encouraging and touching. President Obama was as eloquent as ever. London’s mayor Boris Johnson sounded mildly Churchillian. Benjamin Netanyahu from Israel was blunt and forthright. But we can assume these attacks won’t be the last ones. France is in a state of emergency. The security services in Europe and North America are on a state of alert. My spouse traveled on the Washington, DC-to-New York train Friday night and it was full of sniffer dogs and police. We risk a return to the national fear that gripped us after 9/11. 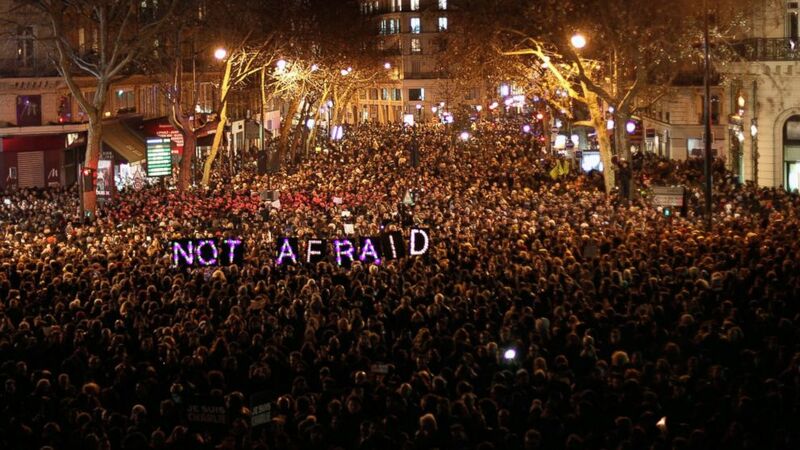 Parisians got it right when they assembled in large numbers and unfurled a sign saying “not afraid” in the hours after these attacks. But not afraid of what? The terrorists for sure. But also let’s not be afraid to distinguish between terrorists and Syrian asylum seekers. Between those who invoke the forces of evil and those imams who decry it. Between our Muslim friends and neighbors and our fanatical enemies. The lives of Parisians will not be the same after November 13. But, knowing the city and its inhabitants well, I believe that they will not be deprived of oxygen and disappear into the vortex of hate preached by jihadists – or Europe’s extreme nationalists. Civility, albeit wrapped in an iron fist, will be their response. Simon Reich is a Professor in The Division of Global Affairs and The Department of Political Science, Rutgers University Newark. This article was first published on The Conversation and can be found here. Image credit: CC by Evan Bench/Flickr. Airpower and the ‘Global War on Terror’: Can lessons be learned from Operation El Dorado Canyon over Libya in 1986?